Today’s scripture concerns Martha and Mary, whom we meet again in John 11, where Jesus raises their brother Lazarus from the dead. Today’s episode seems very low-key, very mundane in comparison: Jesus isn’t raising someone from the dead or even healing the blind or lame. But he is healing someone—someone who feels overwhelmed and stressed-out. Couldn’t we all use that healing? Last weekend, which was a long holiday weekend, Lisa, Elisa, and Ian went with our German exchange student to Disney World, leaving Townshend and me at home as “bachelors” for the weekend. Monday was my day off. I went for a run early in the morning. I was having lunch with a friend up in Alpharetta and had to leave early to make it. When I returned to the house my landlord and his wife were at my house. I had forgotten that they were coming to paint the outside of the house. No big deal. That’s the great thing about renting, right? Let someone else do the heavy lifting. And then I went inside in a panic: “I’ve got clean up around here! The living room, the kitchen—it’s a disaster area! I can’t let the landlord see the house like this!” Remember: Townshend and I were bachelors last weekend. And we’re slobs! And since I have an appointment on the north side, I don’t have a lot of time to spare! So I’m frantically trying to get the house in order! So even last week I could identify with Martha in today’s scripture! I was anxious and troubled about many things! Obviously, if Townshend or I were more like Martha, we wouldn’t be in this mess! Because Martha would make sure our house stayed clean! Martha is often portrayed as the “bad guy” of this story but let’s give her credit for what she’s doing right. Jesus and his disciples were in a town not far from Jerusalem called Bethany, and Luke tells us that Martha “welcomed” Jesus into her home. Martha lived there with Mary and their brother Lazarus, who of course we know from John’s gospel, chapter 11. 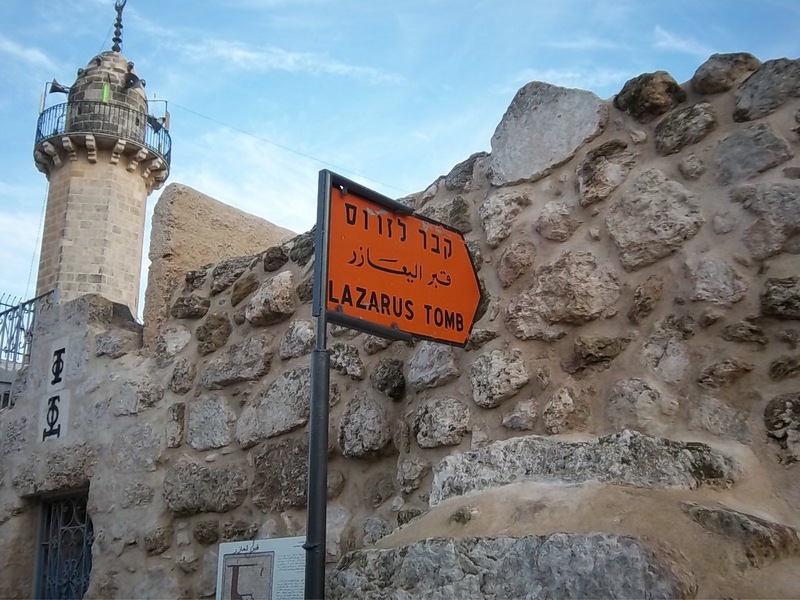 Lazarus dies, remember, and after four days Jesus goes to the tomb and raises Lazarus from the dead. And in the midst of this tearful, dramatic scene, when Jesus orders that the tomb be opened, it’s Martha who says, in the King James Version, “Lord, by this time he stinketh: for he hath been dead four days.” I love that: he stinketh! When I get back from the gym, Lisa can say to me: You stinketh and sound very biblical. But even in John 11 we see Martha being the practical one, the down-to-earth one. Today’s scripture is drastically different from the dramatic story of Jesus raising someone from the dead. What we have in today’s scripture is a normal, everyday, mundane kind of event that any of us can relate to: It has to do with the normal kind of work that we do. In Martha’s case, cooking and cleaning; fixing dinner; entertaining guests. Here, Jesus isn’t doing anything dramatic like raising someone from the dead or miraculously healing someone who’s sick, or crippled, or blind, or deaf. 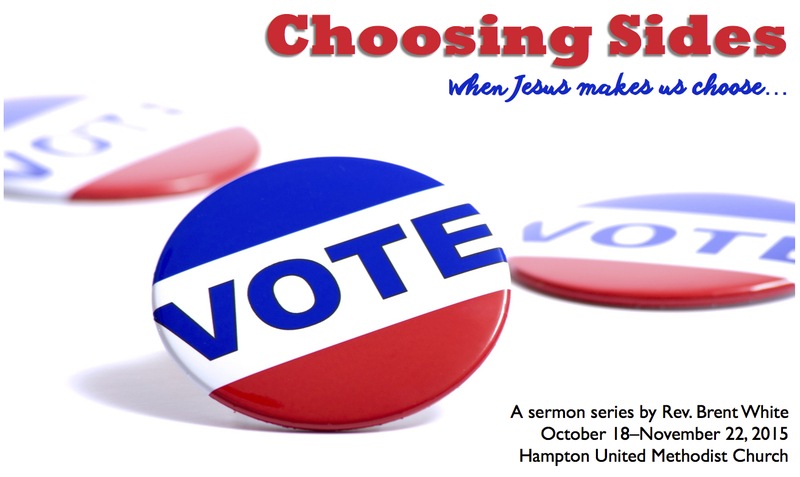 No, in today’s scripture, Jesus is healing someone who feels overwhelmed, who feels stressed out. And don’t we all want and need that kind of healing from time to time? Martha would seem to have good reason to be stressed. One scholar I read estimated that there were maybe a hundred people there. Earlier in this chapter Jesus had sent out 72—not just the 12 disciples but 72—to the surrounding villages to teach, preach, and heal. Were they still with him? Maybe. And then, since Jesus was attracting such large crowds, it’s likely that there were lots of people from Bethany at Martha’s house. We want to judge Martha harshly, but the truth is, it’s because she’s doing all this work related to hospitality that all these other disciples are able to sit at Jesus’ feet and be taught by him. Through her humble service, she’s making it possible for Jesus and his disciples to do the work of God’s kingdom! This is important work! And it’s the kind of important work that so many tireless volunteers do in our church, when they serve on the Finance committee, the Trustees committee, or the SPR committee; when they stock the food pantry and cook meals for grieving families; when they mop bathroom floors and change lightbulbs; when they order office supplies, balance the checkbook, and make sure bills get paid. All this normal, everyday, mundane kind of church work has to get done; it’s not glamorous or exciting. But it makes possible all the other work that we do for God’s kingdom. So again, what’s wrong with what Martha’s doing? She’s quite literally serving the Lord! Did you hear that? Like my friend, we’re in danger of being like Martha when we are so busy feeding others that we don’t take time to feed ourselves; when we’re so busy working that we don’t make time to worship; when we feel like life is just too busy to pray, to worship, to spend time in God’s Word each day. I don’t know who first said this… It’s been attributed to Martin Luther. It’s been attributed to John Wesley… But I love it. One of them said, “I pray for an hour every morning. Except when I’m really busy. Then I pray for two.” We should be too busy not to pray! I feel like a hypocrite saying this because I was Martha—for years before going into ministry, and for years after I became a minister. I’m not proud of this. But I didn’t start out as a Martha! I’ve told you before that I had a dramatic conversion experience in high school. And even at this early age of 14, 15, and 16 I was reading the Bible voraciously; I was telling my friends about Jesus; I was inviting classmates to church; I was sharing my testimony with others. Our youth minister even let me lead Bible studies for the youth group. I was in love with Jesus. I was excited about Jesus. I wanted to share this great love that I had experienced in Christ with others. 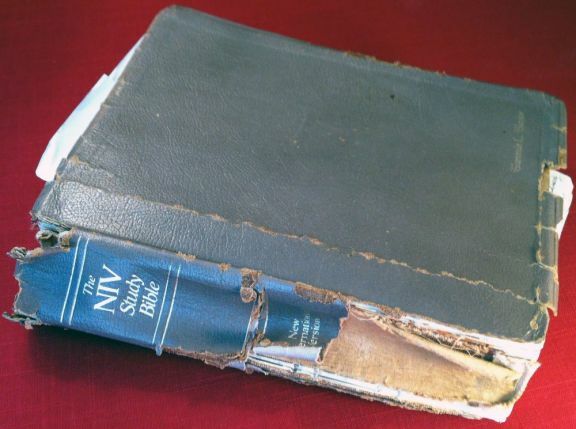 I don’t have my first NIV Study Bible anymore, but it looked something like this. When I was in high school, I bought an NIV Study Bible. Study Bibles are very common now, but I think this was nearly the first of its kind. And I loved it. After a few years, I had read it so much the cover had literally fallen off. I had written in the margins and underlined so many things. But my Bible was falling apart. I wish we all the had the goal of owning a Bible that we read so much that it’s falling apart! Amen? Anyway, before I went off to college, my girlfriend at the time bought me a new NIV Study Bible—not a hardback like I had before, but a leather-bound one. It was nice. It had my name engraved on it and everything. And I thought: Just in time! I’ll take this one to Georgia Tech—it should last me at least another four or five years! And brothers and sisters, I wish I could say that by the time I graduated college, I was ready for a new NIV Study Bible. Sadly, by the time I graduated, that Bible was still in great shape! If they had eBay back then I could have sold it “NM”—near mint. It was in “near mint” condition, unfortunately. Have you forgotten—have you forgotten—that there’s only one thing necessary in this life? To seek first God’s kingdom and his righteousness and all these other things that we tend to get so stressed out about will take care of themselves! Brothers and sisters, heed my warning: Don’t be like me! Don’t make my mistake! I spent too many years of my adult life failing to be as happy as I should have been, failing to be as joyful as I should have been, failing to find the contentment and peace that I so desperately wanted… All because I let all these other desires and concerns—the pursuit of money and possessions, the pursuit of personal glory, the pursuit of worldly success—take the place of the pursuit of God’s kingdom and his righteousness. Like Martha, like the disciples on board that fishing boat, we get stressed out when we think that the Lord isn’t doing anything to help our situation! Lord, do you not care…? But he does care! How do we know? Because he cared enough to to put them in this stressful situation to begin with! Jesus was using this stressful situation—for Mary and for the disciples—to teach them something, to help them grow, to help them trust in him more and more. Whatever stressful thing is happening in our life, we can be sure that we’re not alone, that Jesus hasn’t abandoned us. If the Lord isn’t doing what we want him to do, it’s only because he’s doing something better! If the Lord isn’t doing what we want him to do, it’s only because he’s doing something better! We get stressed because things aren’t going according to our plans? The good news is God has a better plan! O.K., so those are some things that Martha is doing wrong. Let’s spend some time looking at what her sister, Mary, is doing right. First and foremost: Spending time listening to the Lord is so important to Mary that she’s willing to take a great risk. You see, back in the first century, it was, unfortunately, a chauvinistic culture. A woman did woman’s work in the woman’s part of the house—like helping Martha in the kitchen. A woman did not sit alongside male disciples in order to learn from the rabbi. Yet that’s what Mary does… And it was risky because she probably thought that there was a good chance that Jesus would rebuke her and send her back into the kitchen. Or that Jesus’ male disciples would make a fuss and embarrass her or hurt her feelings in some way. Of course, far from rebuking her, Jesus praises her for doing the right thing! But she took the risk because she was hungry to hear the word of the Lord. And when I say that she heard the word of the Lord, I mean she really heard it. She listened to the Lord better than any other disciple. Because of what we see Mary doing in John chapter 12. Jesus was once again in their home, and this time Mary comes and anoints his feet with expensive perfume and dries his feet with her hair. And Judas Iscariot protests, saying how they could have sold the expensive perfume and given the money to the poor. And Jesus said, “Leave her alone. Don’t you get it? She’s preparing my body for burial. She’s anointing my body with perfume in advance of my death and burial”—because that’s one important thing that ancient Jews did when they buried a loved one. You know what’s remarkable about this? What’s remarkable is that, as far as we can tell, Mary is the only disciple of Jesus who understood Jesus, who listened to Jesus, who believed Jesus, when he told his disciples that he was going to be killed and be resurrected on the third day. No one else did! Why do I say this? Well, remember what Peter said at Caesarea Philippi when Jesus predicted his death at the hands of his enemies? “Far be it from you, Lord. This shall never happen to you!” And then we see the surprise and shock on the part of Jesus’ disciples when Good Friday happens and Jesus is dead. His disciples acted like they had no idea that this could happen. They were shocked—they were completely broken up about it. Why? Because they didn’t listen to the word of their Lord… What Jesus was telling them didn’t make sense to them—the Messiah isn’t going to be murdered at the hands of his enemies! Jesus must be wrong about that! They knew better than Jesus! Who are we more like these days when it comes to the Word of God—Martha or the other disciples? When we get to a difficult passage of scripture, for example, do we say, like most of the disciples, “This doesn’t make any sense to me. Therefore it must not be true. Or it must not apply to me. Or I’m just going to ignore it”? Or do we say, like Mary, “This doesn’t make sense to me. But I know it’s true. So I’m going to submit my life to it, and obey what it says”? What does this mean? When the Lord is your portion, it means that the Lord alone is enough for you. It means you recognize that the Lord alone has what you need to fill up your tank, to be happy, to be content. Mary already realizes this. Jesus wants Martha to learn this. What was Martha’s “portion” when she felt anxious and distracted? What did she think she needed in order to be happy? Perhaps the praise of others for the great work that she was doing. She needed other people to appreciate her, to recognize her, to stroke her ego and make her feel important for all the hard work she was doing. Instead, everybody seems to be ignoring her good work… even her sister Mary. I mean, why should she perform this act of service, and give everybody else what they need, when she’s clearly not getting what she needs? Her portion wasn’t the Lord; it was the praise and adoration of other people. I told you my experience earlier: When I was a young Christian I understood that the Lord was my portion—the Lord was everything I needed—but I lost my way for a long time. I thought “my portion” would be found in worldly success, in praise and recognition, in money and possessions. But that was a dead end—and I hurt myself for a lot of years, and hurt others, figuring that out. Thank God about six years ago, I realized once again that the Lord really was my portion. This entry was posted on	October 21, 2015 at 10:39 pm	and is filed under Uncategorized.